Understanding the invoice for your photography and floor plans. 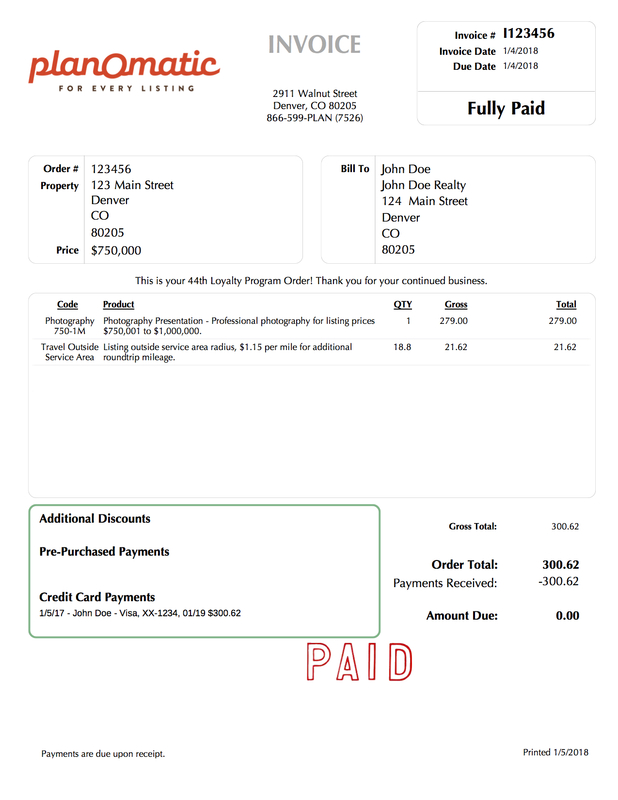 PlanOmatic sends out an invoice by email within a business day after each order is completed. Your invoice is also your receipt. The first part of your invoice contains the invoice number, date and status. Below this, you will find the order number and property details to the left and your billing address to the right. Next, you will see the services rendered by line item. Lastly, the bottom right side displays any payments applied to the invoice. On the left, you will see your gross total before discounts, total after discounts, payments received and amount due. For any additional questions about your invoice not answered here, please click the button below or email billing@planomatic.com.